I'm Samara, a college kid about to graduate and here are some fads I've encountered throughout my lifetime. Some are awesome, some are funny and some are just plain weird. Enjoy reading! 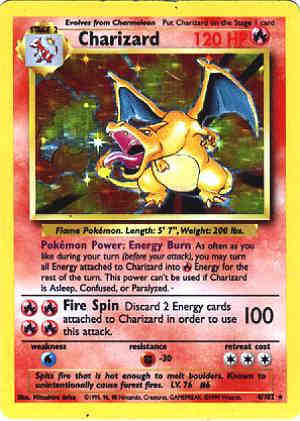 The epic, the Charizard card. 1. Unlike Beanie Babies, Pokémon cards actually ended up being worth a significant amount of dough (The Charizard Pokemon card still goes for 36 bucks). 2. Girls certainly enjoyed collecting Pokémon cards. Though I was not one of them, many girls have assured me they too enjoyed the feeling of ripping open a fresh pack of Pokemon cards. 4. It was addicting. Those cards just took over the schools. People would get those binders just like the Pog binders and have them stacked to the brim with the evolutionary cycle of each of the Pokémon. 5. Energy cards. "Worthless piece of $^&T energy cards" [Another direct quote from Ryan Haughey]. These cards were used to be able to make your Pokémon attack when you played the actual Pokémon game, but who played the actual game? I have learned through research in the game respect Pokémon cards were pretty much like Pogs. Not many people really played the game it was more about collecting the cards that were the rarest. 6. Lunch time was prime time for Pokémon trading. Pokémon trading was an innocent hobby that set the future businessmen from the future social workers. 7. On the bottom right corner of every Pokémon card there was a symbol. You either got a circle, a diamond or a star. Getting a circle meant you got coal for Christmas. Diamonds were neutral and when you got a star you hit the jackpot. The stars were the cards you really got pumped about. Victory dances that looked like this. 8. Pikachu! Though I initially thought this little yellow creature suffered from chronic allergies I learned that this was his actual voice. Pikachu is a central character in the Pokémon anime series, making him one of, if not the most recognizable Pokémon. 9. Here's another funny question that I stumbled upon while on my quest for research about Pokémon cards. Ever wonder how they came up for the names of Pokemon cards? 10. The Japanese obviously had some secret chemical that they were putting into their toys to make them especially addicting. Tamagotchis, Pokémon cards....both were not that fun, but for some reason were that addicting. I agree with everyone of those points. Pokemon cards were HOT. In middle school the teachers would take any Pokemon cards that they see and your parents would have to come to get them back. Which always led to interesting discussions as home. I also remember in middle school people would get beat up for holographic cards. Ultimate pickup line: "Yeah, I write poetry..."
Fads were always fun and ridiculous and above all else: relatable. Hope everyone enjoys the posts. If you have any suggestions on fads to write about speak up!!! Macho Movies Made Easy » Eastwood? No!